Could Tesla Motors CEO Elon Musk’s SEC Troubles Present An Opportunity For GM? In case you missed it, Tesla Motors CEO Elon Musk has stepped down as Chairman of the car company that he co-founded, reaching a settlement with the U.S. Securities and Exchange Commission (SEC) that bars him from being Chairman for a minimum of three years. He also had to pay a $20-million fine, with both penalties relating to his claim via Twitter in August that Tesla had secured the funding necessary to take the company private at $420 per share (per The New York Times). The SEC decided that the Tesla Motors CEO’s Twitter claim was misleading its investors, suing the 47-year-old businessman in federal court. This raises the question: could the Tesla Motors CEO’s tiff with the SEC present an opportunity for the likes of General Motors? GM, too, has a keen interest in helping electric propulsion to proliferate, announcing in June its plans to launch 20 new battery-electric vehicle models by 2023, and cars like the Chevrolet Bolt EV and Chevrolet Volt plug-in hybrid have garnered plenty of praise from industry pundits. Yet Tesla Motors’ market capitalization today stands at $52.2 billion – nearly $5 billion more than General Motors’ market cap – and its shares trade at nine times the price. Tesla’s share value slid dramatically after the news that its CEO was being sued by the SEC, losing 12 percent between September 27th and 28th, although it’s since recovered to about the same value as before the news broke. Shares are still trading far below where they were just after Tesla Motors CEO Elon Musk released his Tweet claiming the company had the funding to go private, however, when value peaked at around $380 per share. Nonetheless, if there is an advantage to be had by General Motors, it won’t be from a loss of share value on the behalf of Tesla – at least not in the short-term. Musk’s settlement with the SEC allows him to stay on as Chief Executive Officer, meaning he’ll continue to exercise plenty of control at the electric carmaker, and his devoted fans have no immediate reason to jump ship. But many see the Tesla Motors CEO’s recent actions as erratic and unpredictable, and the SEC suit might prove to represent a pivotal moment in a chain of events that ends nowhere good for Musk or Tesla. This might be especially true depending on who is made Chairman at the electric carmaker; if Musk continues to attract negative attention, the chances of an ouster might now be substantially higher. Unfortunately for Tesla, much of the company’s high valuation – and indeed, its success – appears to be wrapped up in the cult of personality surrounding Musk. The next few months might be interesting indeed. The answer is No. Tesla’s SEC situation has already been resolved. 20M fine, Elon keeps his CEO position, and leaves the board for 3yrs. Tesla’s board is strongly in favor of Elon, and believes he’s still has what it takes to bring Tesla to profitability. Once 3yrs is over, Elon will return to the board, easily with a large margin in favor of it. Tesla’s stock has surged completely. Was at $265/ share, and is now at $305.64/ share. Even if GM was given the perfect opportunity, it would become a Face Plant. GM has had several opportunities to turn Cadillac into a true game changing luxury manufacturer, which would have less resistance and opposition, than competing with Tesla, and they have failed multiple times on that front. GM is no where near where they ought to be right now. Musk is the visionary behind the company, even if he isn’t the original founder, he has made it what it is. CEO is where he belongs. New quarter numbers are impressive, scaling up going quite well now, and apparently they have turned the profitability corner. I think here to stay. GM better think about bringing it. They still need their quality improved and timelines followed through with. It all depends on how close the Buick Enspire electric CUV concept vehicle is to production because if the Enspire can be brought to production in 8-10 months; Buick using it’s name recognition could steal a lot of business from Tesla. Buick name recognition? Which is: old people. Tesla the the one with a name made out of gold. Andrew, give it up. People on this blog, don’t give a flying fu** about reality. Haha. Haha I know. I’m a GM fan, but also realistic and understand the product. Buick couldn’t bring a new trim package to production in 8-10 months, much less a new vehicle. Much, much less an electric CUV vehicle. I think a closer estimate is 4-5 years. Remember, this is GM we are talking about. The SEC issue is already over and it’s mostly business as usual at Tesla. If GM wants opportunities, it has to create them by thinking outside the ICE car company paradigm. The Bolt was a good start. They must accelerate the transition now. I agree with that. 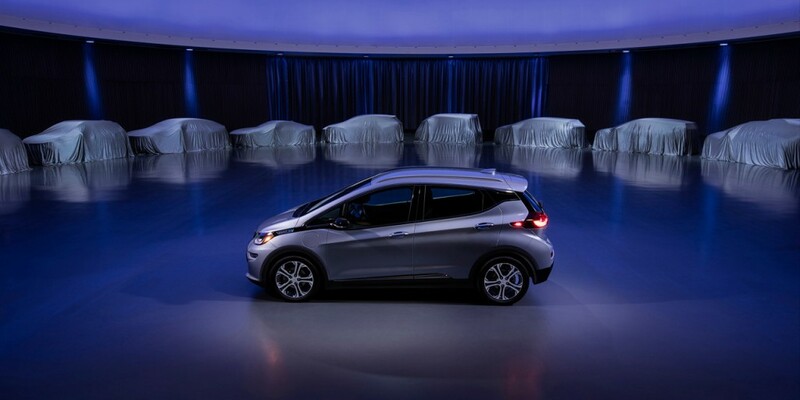 General Motors is rolling out more EV’s, but it seems like it’s coming so slowly. Any slower and they’d be Tesla LOL. why does the author compare stock prices? would gm be more valuable if they did a reverse stock split? let’s say for every 10 shares you own, you now own one. then their share price would be about $340. The honest truth is not Tesla is Dead. But their assured future is far from secured yet also. They are at a tough spot right now as the 3 is just getting up to speed now but quality is lacking. The real problem the income from the 3 is still not in that was expected 3 plus years ago. This leaves Tesla hurting in money as they still are struggling to pay for the 3 program and with losing tax breaks soon it will make it even tougher. They have all the delusional Musk plans but they still lack the money to pay for them and the plants as the are still hurting in the ability to mfg product. Development and. MFG are two very different areas and Tesla really lacks in the latter. They also have two other models in need of upgrades as other MFGs come with new interesting products. Porsche will take Teslas lunch and eat if they do not refresh the S model soon. It really is an old car and styling excites the public. You can’t fix styling with an over the air updates. The key for the other MFGs is they do not have to make money on the small electric segment they just need to refine and reduce cost to where they can make better cars cheaper. Tesla has no luxury here hence the $50k plus car that is not all that exciting. The X is lost in Limbo as they just never sold well and quality issues still linger. The free charging is gone or going away. Let’s just say Tesla can pull this off but odds are if they do it will not be on their own or with Musk leading them. If he can not get his S%#& together soon he will either be in jail m gone or both. Let’s face it he dodged a jail cell here this time. He also has been showing actions that may get him a padded cell too. Tesla was a genius but he was also nuts. He had more crazy ideas than ones that worked. He became more legend than practical. In the end he died nuts, penniless and in love with a pigeon in a NYC hotel room. The electric car is a marathon not a sprint race. Those with great resources, deep pockets and greater goals know this and are pacing themselves because they can. Musk has made it a sprint because he has no luxury of time. He needs to gain a lead now but with the problems is is falling slowly back and with little money for all the promised projects he will fall behind. The guy leading the first lap a Le Mans seldom wins. Right now Tesla’s goals need to focus on survival. This means gaining income to develop new product and focus on products that make money. They also need to add to the staff for MFG as they can not afford another 3 like start up. To be honest I would invest in the S and update it in enough ways to excite the base enough to buy a new car as it was a very profitable vehicle. The 3 is a tough way to fund a company. Volume is no way to make money if mfg is your weak point. Keep dreaming sis as things are not as good as you think. Lol! They need the Capital to get the 3 into production. Where will the roadster be built and how will the fund it with the low capital they have now while doing development. Capital is behind plans by 3-4 years and that is hard to make up. Hence the tease tweets to try to manipulate the price of the stocks. Many need to understand Musk was not penalized for an accident but for an illegal action he thought he would get away with. That is a sign of someone neededing capital. I always was a big John Delorean fan, he claimed he was was set up but he was looking for capital. He was desperate and wrong for what he did set up or not. I am not going to say Tesla will fail as they very well can make it but the path forward is only going to get steeper and more narrow. The advantage of being the only fish in the pond will vanish to other well capitalized companies that will be able to be more cost effective. Tesla would be best suited to develop and sell auto systems to MFGs that can not afford the development cost. They also would be better suited to focus on the higher priced S and the Sports car to keep to higher profit models to keep the capital coming in. In many cases, having the founder and visionary behind the company posted as CEO indefinitely becomes a problem. After 15 years without posting a profit and a disasterous Model 3 roll out, I think Musk needs to be replaced. His vision and determination don’t excuse his consistent practice of over promising and under delivering. His legal screw up with the tweet about taking Tesla private is just more evidence that he is one of those founders that maybe shouldn’t be CEO. Like Henry Ford. He was a genius and visionary for the model T. But then he began to lose his way. Henry wanted to stick to the T and faught Edsel on the Model A and 32 Ford as well the Flathead. Henry then got off into other things like anti Semitic beliefs and approved of Hitler. Not saying Musk is a Nazi but he has gotten off track and has become as much a problem as benefit to the company at a time they can ill afford it. Even the best in history we’re far from perfect and nearly run their companies into the ground. We have an erratic F**ktool in the WH and idiots support him while the economy is good – everything else be damned! If Tesla products were poor, he’d be out. He however is a visionary and he’s here for the long run unless he can’t sell cars. When the economy tanks, the same thing happens to orange man. He’s already an empty suit and a horrible human being, and right now all he can do is claim the economy he inherited and sustained (to some degree).